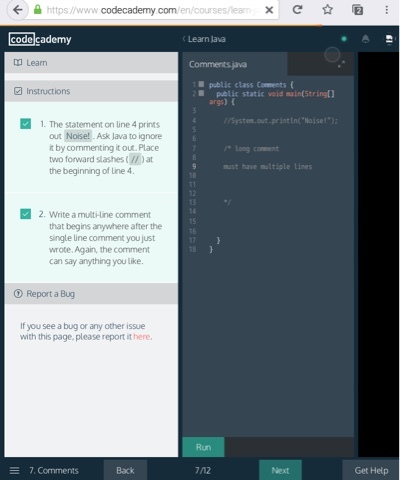 In this Codecademy.com Java exercise 7/12 Comments, the exercise requires you to "comment out" line 4 and make a multi-line comment. Engineers use comment frequently to make their code more readable for other engineers and also their future self. Professional developers write thousands line of code in a matter of months or even days. It will be hard to remember all the nuances. Comments in plain concise English really helps. It's also a great way for beginners to take notes while learning to code. This seemingly trivial exercise is actually a testing method frequently used by developers to test what a line of code does or should not do. They comment out the target code line(s) to see how the program run without those line(s) of code. In this exercise, part 2, you must write a multi-line comment. A single line comment marked with // won't pass part 2 of the exercise. Codecademy will throw an error.